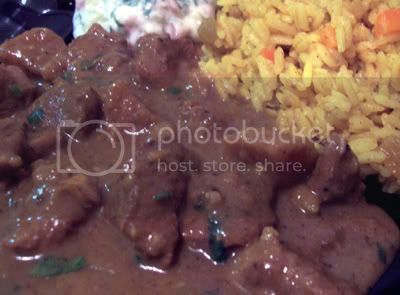 Finally, here is the highlight of the Indian dinner, the lamb curry! Every time I go into Costco’s meat department, the lamb just keeps calling my name and I can’t go by without stopping to contemplate the things I could do with lamb. Lamb curry is my favorite thing to order at the Indian restaurant so it has been on the top of my list of ‘ways with lamb’.This recipe was also from the All Around the World Cookbook by Sheila Lukins . Heat the oil in a large heavy pot over medium high heat. Brown the lamb cubes in the hot oil in batches. Remove to a bowl and set aside. To the oil remaining from the lamb, add the onions, garlic, ginger, apples and bananas. Add more oil, if necessary. Saute’, stirring often over medium heat until tender and lightly colored, about 10 minutes. Sprinkle the flour, curry powder, nutmeg, cardamom, and salt over the onion mixture, add the cinnamon sticks, and combine well. Cook, stirring constantly for 5 minutes to mellow and bring out the flavors of the spices. Return the browned lamb cubes to the pot and add the chicken broth. Mix well. Bring the mixture to a boil over medium-high heat. Reduce the heat, cover, and simmer for 1 hour (until lamb is tender), stirring occasionally. The sauce should have a creamy, thick consistency. If it starts getting too thick, add a little more broth or water. When the lamb is tender, remove the curry from the heat and gradually stir in the coconut milk and then the fresh cilantro. Serve warm over Spicy Marigold Rice and accompany with Raita Cool Down. hi jane, I used ripe but still firm plantains. Good luck with the curry. I hope it turns out well for you. It’s really delicious. 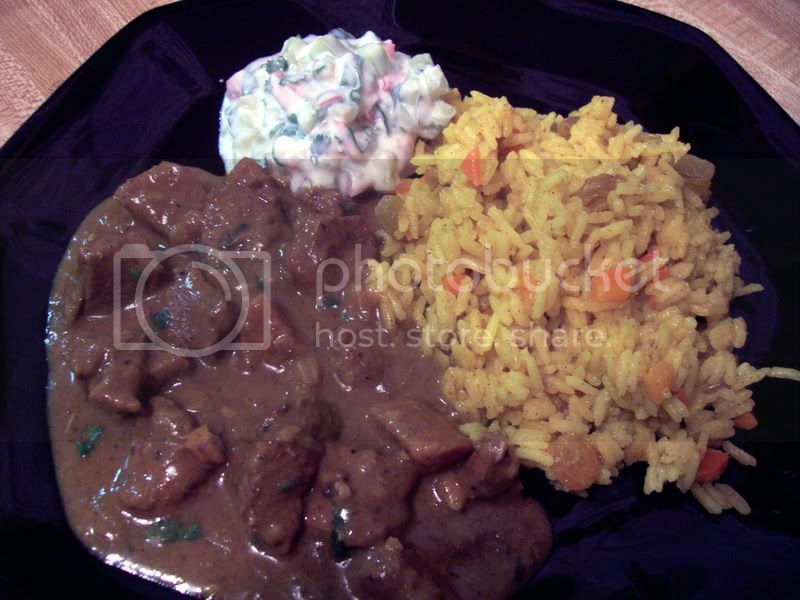 That lamb curry looks delicious! I’m planning on trying out the recipe this week. For the plantains, do you use green or ripe ones? I just stumbled accross your blog by using stumbleupon and love the design of the whole thing! I normally skip straight past food blogs as I have over 20 in my RSS and dont even have enough time to read the ones that I have! I am started out as a blogger myself and always tried to keep the design simple like yours as I think it is crucial, especially if you can back it up with some nice food pics like yours! Keep up the good work and if you feel like sharing some of the photos with other foodies pop over to http://www.ifoods.tv which is my new site for foodies! Cheers!